Tickets for Penthouse at Royalton Hotel New Years Eve 2020 are currently not on sale. Indulge in the ultimate party luxury this New Year’s Eve with the Penthouse party at Royalton Hotel, Times Square New York City’s premier luxury boutique hotel. This swanky, black-tie optional and hyper-exclusive penthouse party overtakes one of Royalton’s luxurious penthouse suites to bring New York’s finest partiers a taste of the high-life amid glittering Times Square NYE action. 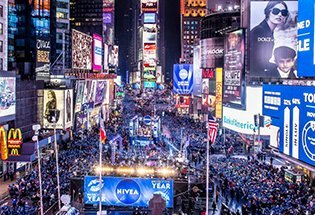 Join a select in-group of NYC revelers and celebrate New Year’s with a deluxe party marked by ultra-exclusivity, opulence, and high-octane party atmosphere. You’ll have access to the main Royalton party below but nothing speaks NYC-only, uber-stylish luxury like Royalton’s NYE penthouse party. 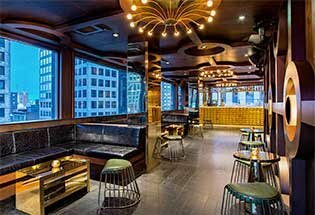 Take this New Year’s Eve in NYC to the top with an extravagant Penthouse party at Royalton, a jewel in Times Square’s dazzling hospitality and nightlife scene. Indulge in a 4 hour premium open bar as you mingle with this best-dressed and super-exclusive crowd or saunter through Royalton’s beautiful space - guests at this deluxe party will also have access to the main Royalton NYE party taking place in the Forty Four lounge. To satisfy your other party appetite and to turn up the holiday mood, this lavish party will offer guests complimentary amenities including early evening passed hors d’oeuvres and festive NYE party favors. But the Penthouse will truly heat up as a live DJ spins a white-hot mix of Top 40, Hip Hop, House, Mash Ups and Dance so these special guests can dance and revel until well into next year. When it is time to ring in the New Year, the DJ will lead whole crowd in a thrilling live count down, complete with a classic glass of champagne, compliments of your host. To amplify this Penthouse party’s luxury, there will be special VIP options, including coveted table and bottle service and more, so you can party like a true nightlife royalty. 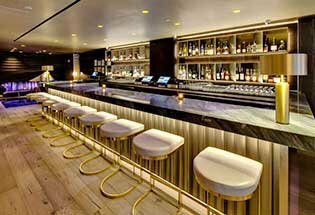 Created by nightlife and hospitality impresario the Morgans Hotel Group, Royalton is a Times Square icon and a premier luxury hotel-slash-nightlife destination. A favorite hotspot of NYC’s creative industry and social elite, Royalton boasts a deluxe exterior – an all-white façade cut by a massive crimson door – and an even more majestic interior – floor to ceiling hand-cast bronze fireplace, towering building façade screen and hand-upholstered leather walls all speak to the grand extravagance and style of the hotel. Ascend this elegant space and find yourself in a magnificent, luxurious Penthouse suite where an ultra-sleek modern design complements the sublime, on-top-of-the-world atmosphere. 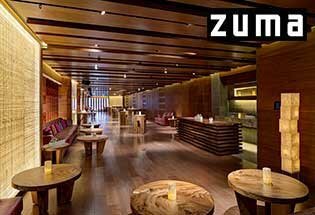 Geometric floors and lighting accents, contemporary décor and lavish leather seating, floor-to-ceiling windows - not to mention a private outdoor terrace - to take in the spectacular NYC night lights: this NYE at the Penthouse at Royalton is a taste of party opulence that will start your New Year with a bang. Live it way up this New Year’s at the Penthouse party at Royalton Hotel. Take part in an ultra-exclusive, super-luxurious, and high-voltage celebration that will truly be a royal NYE experience.